American River College hosted this semester’s Welcome Day and Club Day on Sept. 22 in addition to the Health and Wellness Fair. Several clubs set up their tables with music and eye catching artwork in hopes to attract students who share their interests. “I really like the high energy and how busy Club Day is at (ARC),” said Jonathan Bates. Several vendors set up booths in front of the library and next to the cafeteria to draw in more students. “It’s cool seeing people on campus showing off stuff that they made and hoping students will buy it. It’s great to know it was made in my community,” said Bates. The vendors sold a plethora of items such as clothing and hand-made jewelry. “I always look forward to Club Day because it’s nice seeing everything that my school offers,” said ARC student Kayla Jones. A sense of school spirit flooded the air when students were seen wearing ARC t-shirts and visiting as many booths as possible. “This is my first semester at ARC, so I really wanted to get very involved. … I bought of couple shirts for my friends and I wanted to check out Club Day,” said ARC student Breanna Addams. This semester’s Club Day seemed to attract a lot of new students. “This is my first Club Day at ARC, and I belonged to a lot of clubs in high school and I was really into school spirit, so I think joining a few clubs would be good to do in my free time,” said ARC student Hanna Bishop. Also, there were several new vendors this semester as well in addition to some that have been coming to Club Day and other ARC events for years. 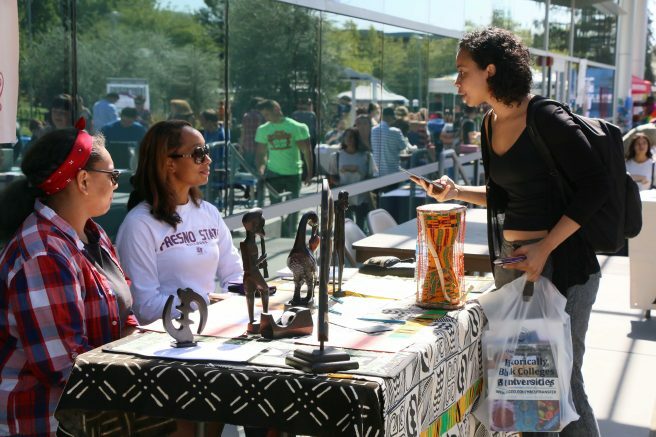 “I like coming back when (ARC) hosts something like Club Day because it gives people a chance to see what I like to do in my free time and I also make a little profit, which really helps me out,” said ARC student and jewelry vendor, Linda Hernandez. “I like Club Day because it makes it easier for me to recruit people who are interested in some type of fashion, and also recruit models to wear the clothes that we are designing for a possible fashion show at the end of the semester,” said Fashion Club Vice President Tylannia Brooks. But most of the clubs at ARC are not exclusive to just the campus. Latinos Unidos is a student run club at ARC and is open to everyone of all ethnicities. Latino Unidos is hoping to raise enough funds to start a scholarship for students next semester. “We really want to reach out to our community and give back the best way we can,” said secretary and treasurer for Latino Unidos, Stephanie Lorenzo. Be the first to comment on "Greek week is capped off by Welcome Day"